Personal Initiative (PI) means being self-starting, future-thinking, and overcoming barriers. It is a psychological construct which can be developed by changing people’s mindset. PI Training is based on action regulation theory (Frese & Zapf, 1994) which holds that actions are affected by goals, a search for relevant information, plans, and obtaining feedback. The training follows an interactive, action-oriented methodology that allows participants to learn by doing and to immediately apply the content to their own business. A distinguishing element of PI Training is that it is based on scientific evidence. This means that consolidated findings from psychological and entrepreneurship research are translated into so-called action principles. Action principles are rules of thumb that guide entrepreneurs to show (more) Personal Initiative in a very practical and easy-to-grasp manner. With PI Training, goal-setting, searching for information, planning, and feedback is related to each of the three components of Personal Initiative. For example, goals should have a unique component (self-starting) and should be long-term (future-thinking). Back-up plans ensure that entrepreneurs can keep on working toward their goals in spite of obstacles. PI Training combines a top-down (teaching action principles) with a bottom-up approach (learning through action and by making errors). Case studies as well as individual and group activities enable entrepreneurs to apply a proactive mindset to their own businesses already during the training. We also emphasize the important role of negative feedback because it provides valuable information on how entrepreneurs can improve their businesses. PI Training therefore encourages participants to provide both positive and negative feedback to each other’s ideas, goals, and plans. A good example of how PI Training differs from other entrepreneurship and management trainings is its perspective on sourcing finances for a business project. 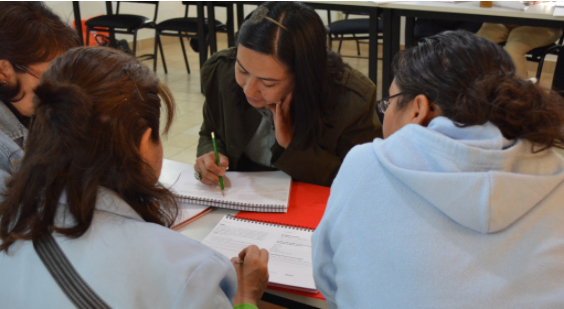 In the “traditional” training program, participants learn how to keep financial records, they get to know lending products offered at banks, and they learn what is needed to apply for loans. In PI Training, entrepreneurs are taught how to identify and make use of unusual sources of money (self-starting) and how to bootstrap so that they do not rely on external funding in the long run (future-thinking). They also learn to develop a plan B or even plan C in order to be prepared if financial problems occur (overcoming barriers). In short, PI Training rather teaches entrepreneurs how to fish than to give them the fish.